Bite Resistant Plastic. Same as 575 in bite resistant plastic. Small shepherd mouth whistle. Ultra high tone. Shepherding whistle. This whistle is used to give commands to herding dogs that help herding sheep. It can be used for the sport called ‘Treibball’, originating in Germany. Built with a loop to attach to a lanyard. Size: 1.75" X 1.5" X .25"
Available in Black, White, Red, Green, Orange, Blue. Shepherds Mouth Whistle used for years by professional dog trainers. 1. 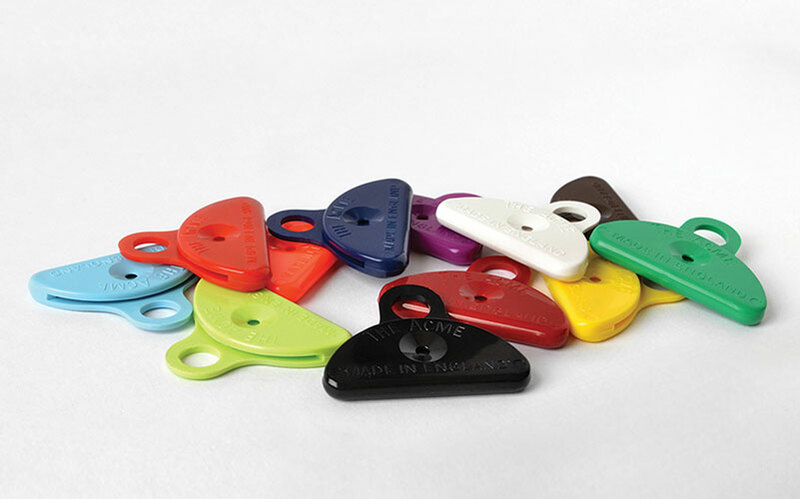 Place whistle in mouth with the curved open edge facing outwards. 4. To create an even wider range of sounds, move the tongue up and down reducing the widening the gap underneath the whistle. Note: If you place your tongue against the lower hole you will silence the whistle. It doesn't matter which way up the whistle is placed. This is just one of nineteen outdoor whistles & calls in the world famous Acme range. This whistle does require a few practice blows before you get a sound, but once on sound is achieved, it is plain sailing or whistling.